Map of the 34 volcanoes where MODIS detected at least one effusive basaltic eruption in the last 15 years (for the period 2000-2014, inclusive). Credit: Modified from Google Maps. Researchers from the University of Hawai'i at Mānoa (UHM) School of Ocean and Earth Science and Technology (SOEST) recently discovered that infrared satellite data could be used to predict when lava flow-forming eruptions will end. Using NASA satellite data, Estelle Bonny, a graduate student in the SOEST Department of Geology and Geophysics, and her mentor, Hawai'i Institute for Geophysics and Planetology (HIGP) researcher Robert Wright, tested a hypothesis first published in 1981 that detailed how lava flow rate changes during a typical effusive volcanic eruption. 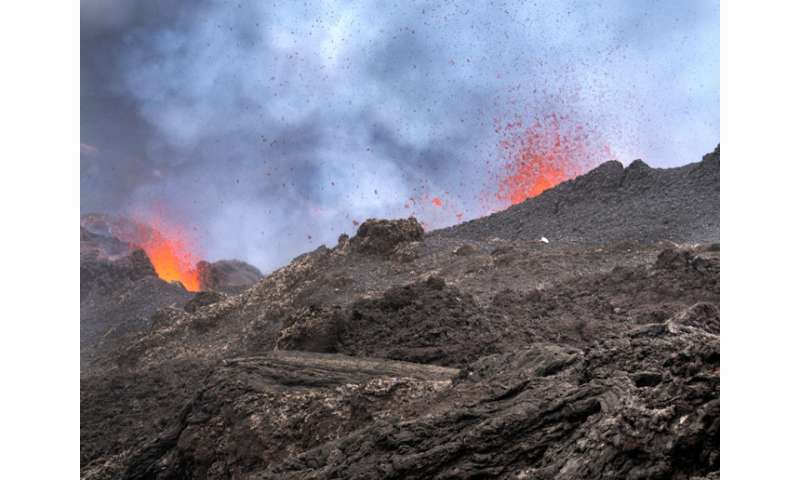 The model predicted that once a lava flow-forming eruption begins, the rate at which lava exits the vent quickly rises to a peak and then reduces to zero over a much longer period of time—when the rate reaches zero, the eruption has ended. HIGP faculty developed a system that uses infrared measurements made by NASA's MODIS sensors to detect and measure the heat emissions from erupting volcanoes—heat is used to retrieve the rate of lava flow. "The system has been monitoring every square kilometer of Earth's surface up to four times per day, every day, since 2000," said Bonny. 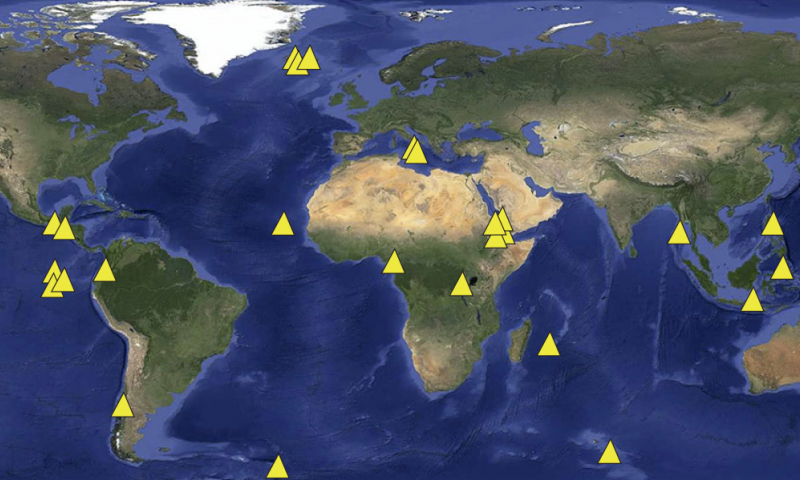 "During that time, we have detected eruptions at more than 100 different volcanoes around the globe. The database for this project contains 104 lava flow-forming eruptions from 34 volcanoes with which we could test this hypothesis." "Being able to predict the end of a lava flow-forming eruption is really important because it will greatly reduce the disturbance caused to those affected by the eruption, for example, those who live close to the volcano and have been evacuated." "This study is potentially relevant for the Hawai'i island and its active volcanoes," said Wright. 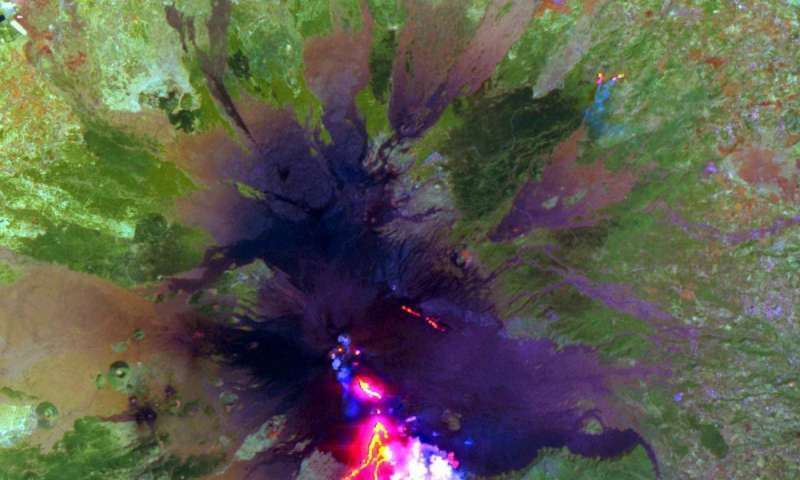 "A future eruption of Mauna Loa may be expected to display the kind of pattern of lava discharge rate that would allow us to use this method to try to predict the end of eruption from space." From the latest mass push of "forest fire real-time watchdog and topography updating" satellites with only one or two to five year lifespan being put up at the moment, it does not surprise me at all that they can utilize data on volcanoes. Alot of money and rush to watch forest fires, preplanned for years. Im cynical considering the lack of ability to stop the fires not being addressed more or questions as to why they are not being stopped. But its nice they can adopt watching volcanoes and adjust for when they will stop. But fail to address that new models are available for knowing in advance WHEN they will erupt. Ethics are passe it seems.